Many would say not; Scotland’s second-highest summit is merely the highest nubbin on a flattish plateau in the Cairngorms. No wafer-thin ridge or heady climb to get the pulse racing, just a trudge along a wide, rock-strewn path. 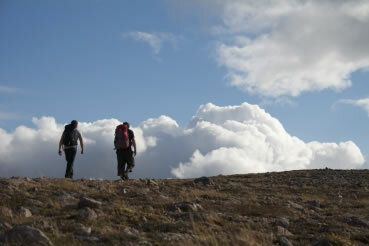 It may reach 1309 metres, but you can get a railway or ski lift up most of its height, if you walk over from Cairn Gorm. But while it lacks a certain drama for hillwalkers (it’s a very different proposition in winter conditions), this big beast does have one thing that counts – an unsurpassable location. 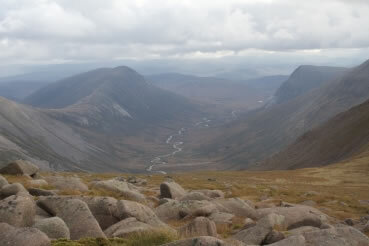 Across the vast chasm of the Lairig Ghru lie the giant bite-mark valleys of Coire Bhrochain and An Garbh Choire, their dark crags rising up to Braeriach and Cairn Toul. Undoubtedly these are more interesting summits but surely, then, they are best admired from afar? There’s an episode of the TV series ‘An Idiot Abroad’ where Karl Pilkington visits Petra, Jordan’s world-famous rock-cut city. Rather than exploring the famous relic, he opts to sit in a cave across from it. Why? “You’re better off living in the hole, looking at the palace, than living in the palace looking at the hole.” The man has a point. The same reasoning applies to the northern Cairngorms. 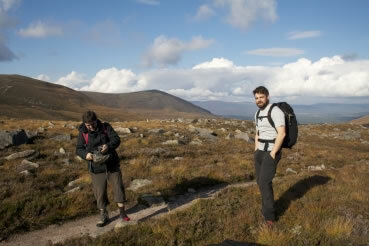 Over two days Mike (brother), Stevie (friend) and I did both walks from the ski centre. The trip to Braeriach had more interest, not least negotiating the huge Chalamain Gap, but the views on route to Macdui’s summit cairn were definitely superior. 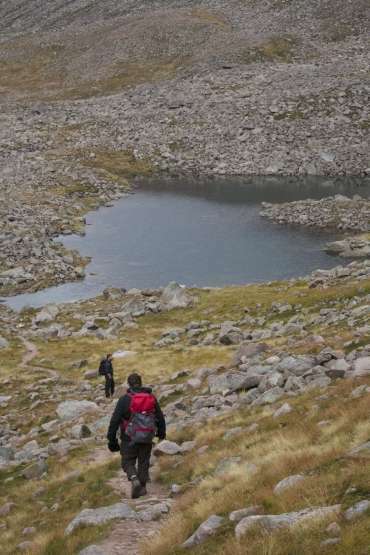 And Stevie’s insider knowledge even upped the interest by taking us back via the Goat Track, a climbers’ path into Coire an t-Sneachda (look for the start of the route on the cliff edge along from Cairn Lochan). We were lucky; both walks were completed under bright October skies, with a comfortable night in Cairngorm Lodge SYHA in between. 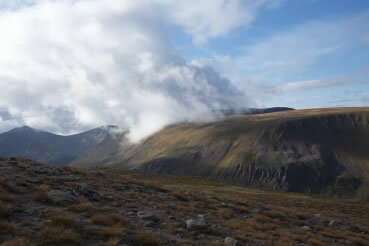 But if time allows for just one walk, my tip is Ben Macdui. Braeriach has the looks, and probably more of the charm, but as Karl says, sometimes “you’re better off being the ugly one”.